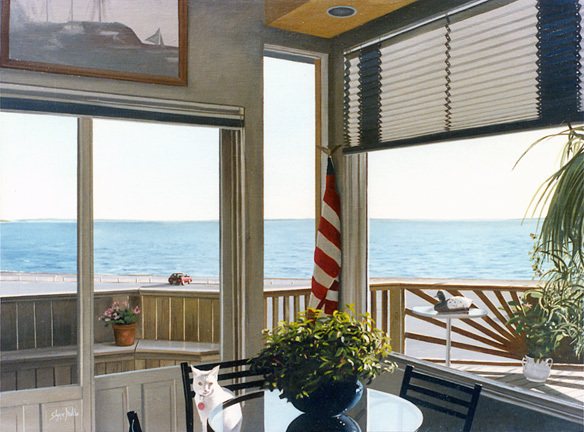 Home - Photorealism – window view or painting? 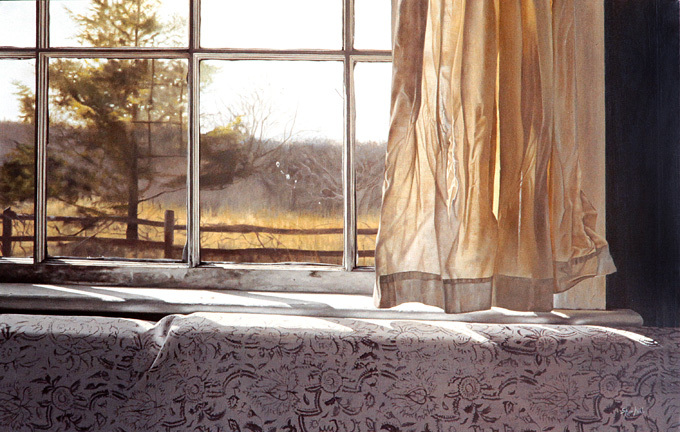 Photorealism – window view or painting? Have you ever heard of Photorealism as an art form? Until I started to investigate the word recently, I did not know what it meant. Photorealism is a painting style, created by gathering lots of photographs and then painting in a style that looks like a photograph…confusing? Basically, people who can do this are very talented artists! This style of painting originates from the USA and began in the late 1960s early 1970s. The artist Richard Estes is considered to be one of the founders of this form of painting along with Ralph Goings, Chuck Close and Duane Hanson. Today, a renowned modern artist who has taken up this painting technique is Steve Mills from Marther’s Vineyard in the USA. Steve has been painting since he was a child. As a child, unlike other children, he preferred to use a pencil rather than crayons as he was able to achieve finer detail in his pictures. His talent grew and it culminated with his first oil painting being sold at the tender age of 11 years old. What grabbed our attention was his paintings of windows. They are truly incredible and I think that if you didn’t know it was a painting, you would think it is a picture. Steve paints a number of different scenes and obviously loved beautiful window scenes. My favourite painting is ‘Awaiting Summer’, although ‘Cat in the Window’ is lovely too. I love ‘Awaiting Summer’ because of the mystery surrounding it. The window looks quite old and worn (we would recommend he replaced this with an A-rated Anglian window to stop the draughts). The curtain is creased and the scene outside looks desolate and secluded. It kind of reminds me of a zombie film and I am half expecting to see the living dead walk past the window. The detailing is immense and I could honestly believe it is a photo. The reason I love ‘Cat in the Window’ is because of the realism of a living creature. It is one thing painting inanimate objects, but painting a living creature to such a precise detail that it looks real is pure talent. Beyond that, you have a gorgeous sea view. The sea is calm, the day is sunny and the glass table is transparent yet reflective at certain angles. I also like the irony that this is a painting with a painting in it. Now, I am no artist, but I thought I would have a go at photorealism myself. I did use Paint…not the traditional type though, but here it is. 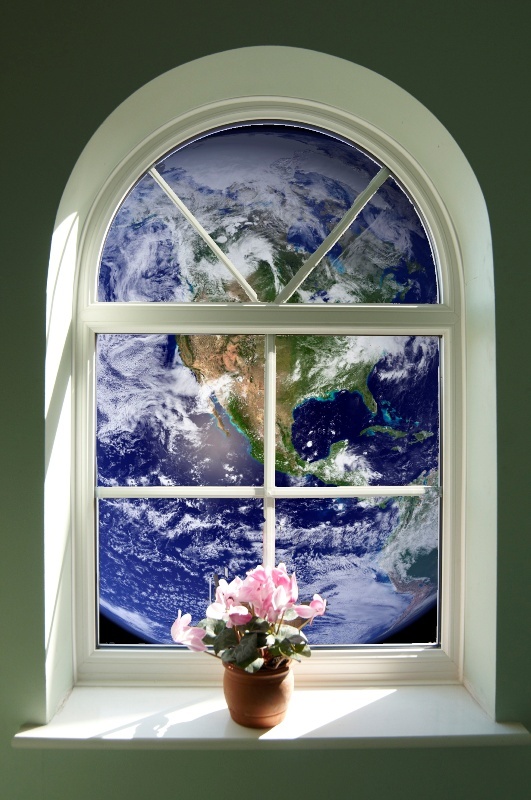 I present to you ‘Window on your World’. If you have some pictures of your view onto the world, we would love to see them! Post them to our Facebook page or take a look at some other pictures that were recently posted to us.